Nothing is as it seems in the small, impeccable town of Rosewood. For underneath Rosewood’s perfection sits unbelievably dirty secrets and lies. 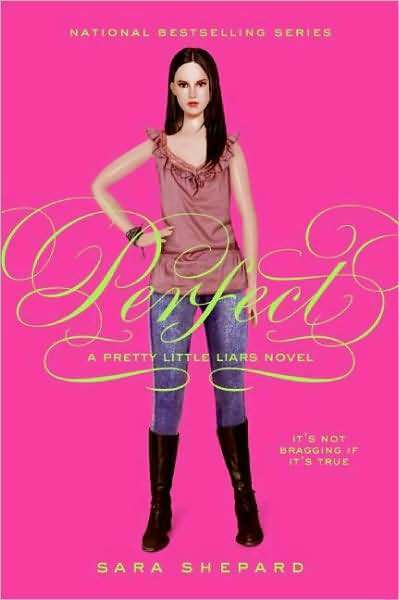 I greatly enjoyed reading Perfect, from Sara Shepard’s Pretty Little Liars series. I really liked that Sara Shepard wrote the book so that each of the four main characters take turns narrating chapters. Each time a character was done narrating a chapter, I had to resist the temptation to skip to the next chapter she narrated. Sara Shepard managed to dangle the truth about who A was above readers’ heads throughout the whole book and kept me wanting to read more and more. Perfect was an amazing, exciting book that I would reccomend to any girl out there who likes drama, mystery, and romance.